On November 30, 2010, Riverside County’s Board of Supervisors unanimously approved an engineering services agreement for the re-design of “A” Street (Fairway Drive). 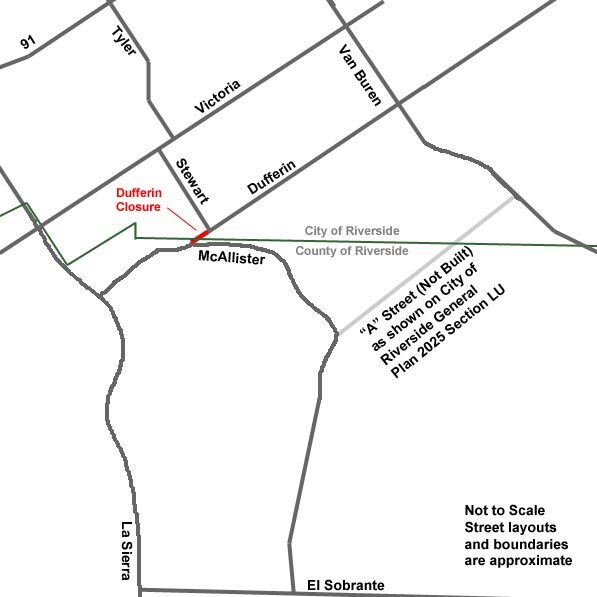 This street will connect McAllister to Van Buren, providing a necessary alternate route for County residents affected by the City of Riverside’s closure of Dufferin Avenue at McAllister. Although the street is not yet under construction, it is nice to know that the County is taking some action in response to all of the residents who voiced concerns about the Dufferin closure. According to the agreement, the re-design project was estimated to be completed by November 2011. BACKGROUND: The “A” Street project is a proposed two lane collector road connecting McAllister Parkway to Van Buren Boulevard that is on the County’s General Plan. Engineering and environmental work was initiated for this road approximately 3-4 years ago by an approved golf-course residential tentative tract in the unincorporated area, which was required to construct the road referenced to as Fairway Drive in the development approval (“A” Street on the County’s General Plan). Design was nearly complete and right-of-way acquisition was about to commence when work ceased on the development project, which went into foreclosure due to the economic downturn. Since that time, the community’s desires to see “A” Street move forward has been heightened by the closure of the extension of McAllister north into the City of Riverside. The “A” Street project is approximately 40% within County jurisdiction and 60% City of Riverside jurisdiction. 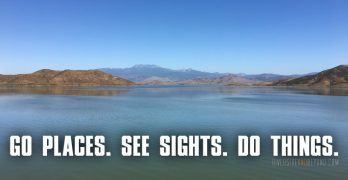 A Scope of Work has been negotiated on this project with Hunsaker and Associates, the engineering firm that did the original road design for the developer, to get this project shelf-ready for right-of-way acquisition and construction. The contract amount is not-to-exceed $156,033, including some optional tasks that may be required as the project progresses. The Scope of Work includes a review and revision of the original design, including additional geotechnical engineering work, to see what can be done to reduce construction costs via a reduced roadway section and engineered slopes. It also includes necessary construction-level environmental work to obtain permits from the regulatory agencies. Once a final design has been completed and cost estimates fine-tuned the County Transportation Department and City Public Works staff will work together to identify a funding strategy for the right-of-way and construction phases of this project. Funding for this work comes from Development Impact Fees collected in this area, since this road will help mitigate impacts of future development. Does anyone know what the status of “A” street is? My understanding is that the County had to go to court to gain access to some of the properties near or in the path of the new street so it could begin the re-design project. I believe the County received permission late last year. I couldn’t find any updated information about the progress of this project on the County’s website, so I have sent another email to Supervisor Bob Buster’s office asking for an update. It took four emails to get a response last time, so I’m not sure how quickly I will get a response. I will also try contacting the transportation department if I don’t hear back from the Supervisor’s office in a week or so. If anyone else finds additional information, please let me know.